Morange is a mobile social network from Singaphore’s MOZAT Pte Ltd. It offers chat, messaging, photo sharing and micro-blogging . The primary mobile interface to Morange is through a Java ME application which can be downloaded directly to your phone from m.morange.com. 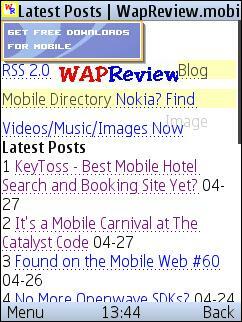 I don’t normally cover apps on Wap Review, as the site’s focus is the mobile web, but a reader tipped me that the latest version, Morange V, has a web browser built in. Mobile browsers are one of my passions so I had to check it out. The Morange client is a 400 KB unsigned Java application. I had no trouble installing it on my Nokia N95-3. My other phone, a Blackberry 7100i, complained of an “Invalid Jar” and refused to install it. For phones that can’t run the app there is also a mobile web interface to Morange’s social networking features at m.morange.com. The Morange app certainly has a lot of features. To start with, there are the social networking services of Morange itself; chat rooms, friends list, private chat, saying (status), mini-blogs and messaging. In addition, Morange is an RSS reader, browser and a push email and IM client. In spite of it’s size and and complexity, the Morange app was not at all sluggish on the N95. In fact it was much more responsive than Yahoo Go or even the latest Gmail app. The email client supports POP and IMAP, with or without SSL, as well as Yahoo Mail and HotMail, including free accounts with have no POP or IMAP support. I tested it with a free HotMail account and it works very well. When Morange is running in the background on the N95 and an email is recieved the phone will vibrate. In that regard it’s similar to the Gmail app but Morange vibrates a lot longer, about 5 seconds, and is harder to miss than Gmail’s wimpy one second vibrate. Plus when Morange gets an email it brings itself to the foreground and turns on the screen. Although billed as push email, Morange, like Gmail, appears to use polling. Morange polls pretty often, the longest I waited for an email was seven minutes compared with up to 20 for Gmail. I haven’t run Morange long enough to test battery life, but that could be an issue with the frequent polling. IM is sent and received instantly. As with email, Morange will bring itself to the foreground and light the screen when an IM is received. It doesn’t vibrate for IM’s though which seems strange as I think most people who use IM consider it more urgent than mail. Supported IM networks are MSN Messenger, Google Talk, Yahoo! Messenger, AIM and ICQ. Finally there is the built in Web Browser. The browser’s best feature is tabbed browsing. Other than that it doesn’t have much going for it. Rendering is pretty bad with overlapping text and images, paragraphs and lines that run together and illegible combinations of background and foreground colors. GIF images with a transparent backgrounds are displayed with a ugly opaque black background. It’s a proxy based browser similar to Opera Mini and UCWEB so it should be fast. While it’s not unreasonably slow, loading and scrolling large pages takes considerably longer than either of the other browsers. I also got a number of 404 “Not Found” errors following links that I know are valid. I can think of little reason to use Morange as a browser today. But it’s a first Beta and will hopefully get better. I was very surprised to see that Morange puts its own ads on third party content in the browser. This is a probably a copyright violation in some jurisdictions and is sure to anger publishers. Morange’s email and IM clients open links in messages using the Morange browser. 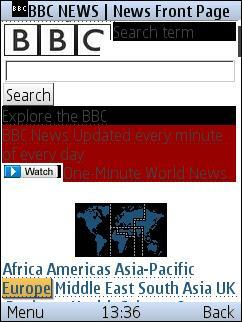 If the browser doesn’t render the page to your liking, on the N95 at least, it’s easy to copy the URL and paste it into a better browser like WebKit or Opera Mini. Although I didn’t care much for Morange’s browser, I rather like the email and IM features and will keep the app on my N95 for those. Update: Reader helloct found a couple of alternate versions of Morange at wap.morange.com/en/download.aspx. There’s a “Lite,” 128 KB Java version for low memory phones (no browser or email) and a native Windows Mobile application (no browser). This entry was posted in Apps and tagged Email, IM, mobile site review, Social Media by Dennis Bournique. Bookmark the permalink. Thanks for the review :). 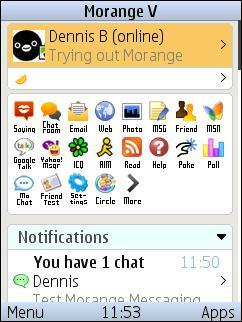 Even though symbian has much better alternatives for IM, i still have a copy of Morange app file on my phone. When someone with a java phone, needs an IM, i can offer them something more than an IM ;). And by the way, their another app like this named Mobii. The only difference with Morange is the name. What i don’t understand is why it’s suggested at getjar.com as “app like this”. It’s a modified version? I don’t know. I know that Opera Mini have a russian modified version but i’ve never see it at getjar as an alternative to the official one. And by way for people with low memory capacity, Morange’s version 3 is lighter.